Our two guests were able to visit Baan Tarn Nam Jai Orphanage where 25 kids joined the weaving project. The next day they went to the CDC at Ban Nam Kem where 20 students participated in learning to weave. Then they headed to the village of Ban Tale Nok to participate in the homestay program. They learned how to make Batik, soap and at night the villagers joined in the weaving project. The last day consisted of learning how to weave roof panels out of Nippa Palm and cooking a delicious Thai desert. Then they took a boat tour through the mangroves to see the surrounding area and how it was affected by the Tsunami. After they left the homestay, they traveled to Ban Pak Treim where the villagers all wove a piece of the cloth. 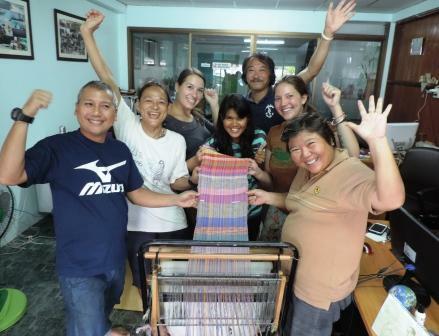 The trip ended at the Andaman Discoveries office with all of our staff weaving a portion of the cloth! We would like to thank you very much for letting Andaman Discoveries join and share in this meaningful project and look forward to the continuation and collaboration between the Saori projects in Japan and Thailand.